LARGE pods of migrating whales have again been reported off the coast this weekend. Social media is abuzz with reports of whale breaches sighted off popular headlands and out at sea. Nowadays drones are offering stunning images and vision of the annual breeding migration from Antarctic waters. 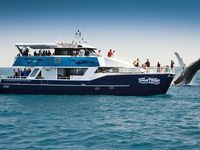 Whale tourism is set to ramp up with whale watching operators to start regular tours in coming weeks. 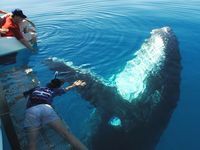 Close up humpback whale encounters: Coffs Coast resident Brett Vercoe's extraordinarily close encounters with humpback whales. 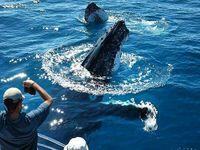 Each year between April and November, Australia's eastern coastline comes alive with the spectacular acrobatic displays of humpback whales. 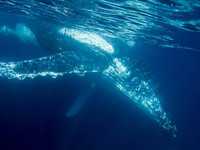 After a summer of feeding on krill in Antarctic waters, these charismatic animals migrate north to sub-tropical waters where they mate and give birth. During their annual migration of up to 10 000 kilometres, humpbacks attract thousands of visitors to coastal towns. 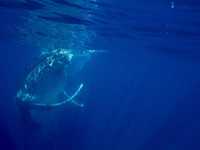 Whale swims under kayak: A fisherman in a kayak off Coffs Harbour captures the moment as a humpback whale swims underneath him and breaches within metres of him. The exact timing of the migration period can vary from year to year depending on water temperature, sea ice, predation risk, prey abundance and the location of their feeding ground. 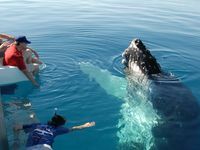 The majority of humpbacks in Australian waters migrate north from June to August, and back towards the Southern Ocean from September to November. 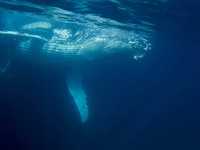 Whale breaching off Coffs Harbour : Brett Vercoe captured this stunning video of a whale breaching off Coffs Harbour's Muttonbird Island. Groups of young males typically lead the migration while pregnant cows and cow-calf pairs bring up the rear. Adult breeding animals form the bulk of the migration in the middle stages. At a maximum length of 16 metres, the humpback is not the largest whale found in Australian waters but it is arguably the most iconic. Recognised by Australians today as more valuable alive, both environmentally and economically, this species was once valued only when it was dead - mainly for its oil and baleen, or 'whalebone'. Beginning in Australia shortly after European colonisation, whaling and the export of whale products became Australia's first primary industry. Australian whalers of the early 19th century hunted from small boats, towing their catch back for processing at shore stations. The development of harpoon guns, explosive harpoons and steam-driven whaling boats later that century made large-scale commercial whaling so efficient that many whale species were over-exploited in the 20th century and came very close to extinction. 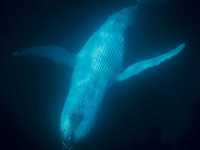 When southern right whales and blue whales became scarce, Australian whalers began to target humpback whales, killing approximately 8300 off the east coast between 1949 and 1962. By the time the International Whaling Commission banned humpback whaling in the Southern Hemisphere in 1963, over-exploitation had already reduced the population to an estimated 3.5-5% of pre-whaling abundance, leading to the collapse of Australia's east coast whaling industry. Whale surveys has the migrating East Coast population of humpbacks growing at around 10% per year, meaning there is believed to be up to 20,000 humpbacks making the migration. Are killer whales cruising our coastline?